Hello everyone! I am Adriano Marini. I was born in Rome in 1972, and just a few years later I started going fishing for trouts with my father, and since then I have been in love with this outdoor sport. The passion for physical activity and fishing has characterised my life since childhood, and today sports and fishing have become my job. 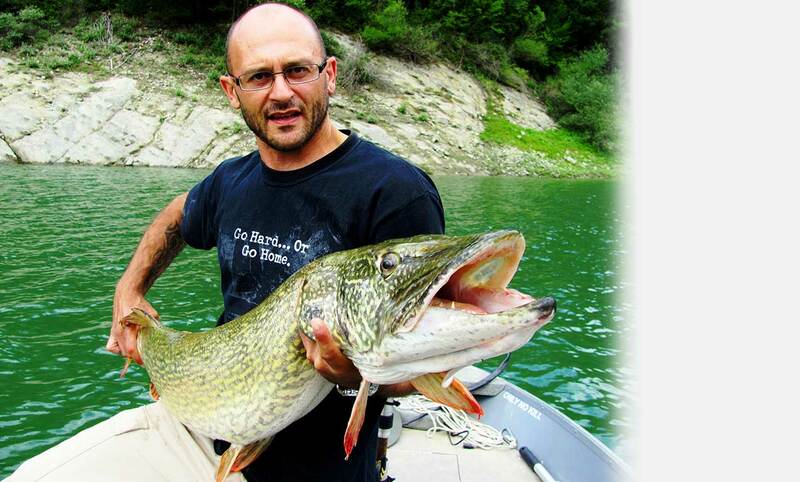 I am a personal trainer at the gym Montesacro Boxing Academy in Rome, where I train boxers and weightlifters, and during my free time I devote myself to many outdoor sports such as hiking, skiing, climbing and kayaking, but my main passion is pike fishing. During my life, growing up, my way of fishing has evolved considerably, to become what it is today: a passion that blends in with the love of nature, the protection of aquatic ecosystems and the protection of endangered fish species.When I was around 14 years of age I have abandoned fishing with natural baits to switch to Spinning, then I start practising catch and release when this philosophy - No-Kill - was still little-known, or at least in Italy.I fish trouts, chubs and bass in rivers and lakes near my house, but there is one fish, in particular, that attracts me: it is a big fish, with a face like a dragon, from camouflage skin, with sly eyes and armed with huge razor sharp teeth, it is the pike. To begin to catch it, I have studied its habits on magazines and books, then I have started looking for it.I did not have any help, back then there were not any social networks dispensing tips and places where to find it, the search was more difficult than expected and capture was a rarity, then slowly, over the years I learnt tricks and places, and began to finally catch some real “dragons”! The pike for me is a holy fish, not to be killed but always released. In my area, as elsewhere in Italy, it is becoming more and more rare and gives way to more robust non-native species. Poaching and pollution are decimating it, for this reason, I try to give my little contribution to the preservation of this species.When out fishing I can remain camped for days in the woods or on an island, I do not need much, I do not need any comforts, wild nature is my home, lakes, rivers and streams are my habitat, it is among civilisation that I feel like a stranger!! Besides pikes, I often do trout fishing in mountain streams, and less frequently, I fish other species, but always with artificial baits.For several years I have been collaborating with Pure Fishing Europe as a Pro Staff angler, testing and promoting fishing equipment, and I have also worked for several magazines for which I write articles on pike fishing.I'm also a fan of photography and an amateur video-maker. In April 2016 I made, together with my colleague Americo Rocchi, the documentary "Pikes’ Secrets 2", a feature film lasting 136 minutes focused entirely on fishing for pikes with artificial baits and the protection of this beautiful creature. And now it's time to start this new adventure: photos, videos and stories of wild fish, with special attention to the protection of aquatic ecosystems.